It’s the crunch. I like the crunch. Put 2-3 cups of iced water in a bowl; keep it handy. Core the apple and cut it in half. Slice each half lengthwise into thin slices. Make stacks of 4-5 apple slices and cut them lengthwise again into thin matchsticks. Soak the apple matchsticks in the prepared iced water. Slice the shallot thinly lengthwise. In a mixing bowl, toss together the shallot slices, tomatoes, the well-drained apple matchsticks, and cilantro. Season to taste with fish sauce, lime juice, and dried red pepper powder. Variations: Throw in about ¼ cup of roasted cashews. Perhaps some grilled shrimp? This is great! 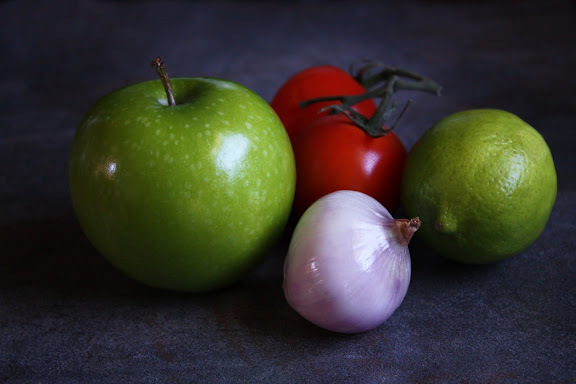 My parents often substitute recipes that call for green mango with granny smith apples because they are so easily available compared to green mangoes. I love that others do this as well! I need to find some fish sauce ASAP. I’ve had this before, though with a bit less chilly and a spoonful of cashews. It sounds delicious, I will try this! Tried this on the zucchini ‘fish’ cakes. They pair up quite nicely. Som Tum is one of my favorite foods…I eat it nonstop when I’m in Thailand. I love this fresh twist on the recipe! Mary – Thanks. But to clarify, this recipe isn’t meant to mimic som tam. It’s more of a salsa-like topping than an entree salad. Perfect for on top of a nice fish. Sounds refreshing, and I love to hear that you just whipped it up to go with a nice piece of fish. I’m allergic to mango so this recipe is perfection for me! Though I toss in peanuts instead of the optional cashews, since I’m allergic to those too. This was great. I skipped the ice water bath, instead making the dressing first and just tossing the apple in that directly. It was a great side salad for some seared tuna. Granny Smith or similar tart green apple[s]. Cut the apples as the original recipe above. Squeeze out juice of half a lime/lemon. Mince/fine dice a couple cloves garlic. Cut up a bit of red or green chili [de-seeded if you prefer]. A half teaspoon of brown sugar [or white!]. A bit of crushed black pepper. Lightly roast a handful shelled and skinless peanuts [or cashews] in a pan. 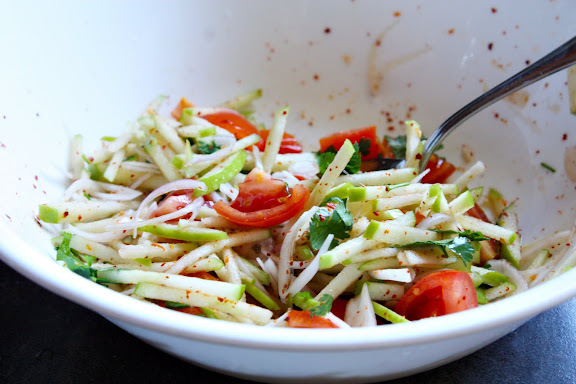 Mix the toasted nuts into the apples, add the spicy mixture, garnish with coriander and mint leaves. I am going to make this for a friend afternoon BBQ this saturday, can i make it on friday night? Not a good idea as apples oxidize and soften very quickly. Refrigeration doesn’t even help. This is best done right before you serve it. I love the idea of green apples! They are so much easier to find in Paris than green papayas. I can’t wait to try this. Thanks for sharing! !